On the occasion of what would have been KP Brehmer's (1938–1997) 80th birthday, the Hamburger Kunsthalle is devoting a comprehensive exhibition to the German painter, graphic artist and filmmaker. Brehmer dealt in his complex work with visual media in the Federal Republic of Germany and the conditions under which image production and reception take place in its capitalist economy. He left behind a diverse, experimental, analytical and yet humorous oeuvre, which is today taking on new relevance and topicality in its questioning of the status quo. The Kunsthalle was the first museum to acquire Brehmer's works in his early years. The exhibition provides a survey of the artist's entire oeuvre, featuring over 200 drawings, collages, prints, paintings and films – including loans from the artist's estate and from international museums. 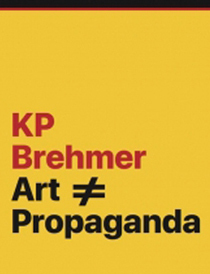 KP Brehmer, whose full name was Klaus Peter Brehmer, belongs to the generation of artists who used the American Pop Art idiom to develop a critical German brand of »capitalist realism« – the title René Block chose for the portfolio he published in 1968 of works by KP Brehmer and his contemporaries Sigmar Polke, Gerhard Richter, Wolf Vostell and Konrad Lueg. Brehmer played a seminal role in passing on this vision, teaching for decades as a professor at the Hochschule für bildende Künste (art academy) in Hamburg. His original training in photomechanical reproduction techniques meant that the principle of maximum reproduction and dissemination of images would have a decisive influence on his theoretical thinking and artistic practice. Brehmer lifted images from advertising, public television and the illustrated press as well as motifs from political propaganda posters and cast them in a changed context, using graphics more radically and consistently than any other artist as a tool for visual political agitation. For KP Brehmer, graphic art was not just a technique but an instrument and metaphor for rendering transparent the conventions of social and political representation. By appropriating the aesthetics of advertising displays in department stores, of stamps as symbol of state values, and of information media such as diagrams and statistics, and then recoding them through slight shifts in meaning, he laid bare the mechanisms that gave them their impact. He thus pilloried the strategies of the established media while reflecting on the means and effects of deception and influence. The exhibition is a joint undertaking by four institutions and will be shown at all four. In addition to the Hamburger Kunsthalle, the partners are the Neues Museum Nürnberg (26 October 2018 to 17 February 2019), the Gemeentemuseum in The Hague (7 July to 27 October 2019) and ARTER, Istanbul (27 March to 30 August 2020). Jointly developed in a close and intense dialogue, the exhibition was conceived with the aim of demonstrating KP Brehmer's topicality both in Germany and beyond. Sponsored by: Kulturstiftung des Bundes, Deutsche Bank, Ministry of Culture and Media Hamburg, Malschule in der Kunsthalle e. V.
Find helpful information for your visit here.